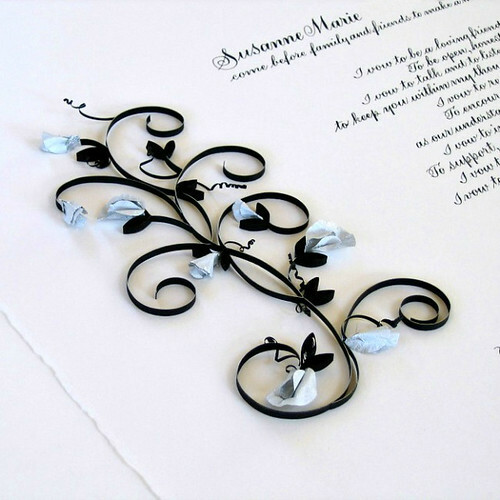 I enjoy lots of things about creating custom quilled marriage certificates and wedding invitations... not only planning and implementing each design, but often the story that goes along with it. Such was the case with this one that actually had its beginning nearly five years ago! The bride-to-be contacted me about a certificate prior to their wedding in 2010. She had a color scheme and layout in mind, as she loved the dramatic black and silver arcs of this design. 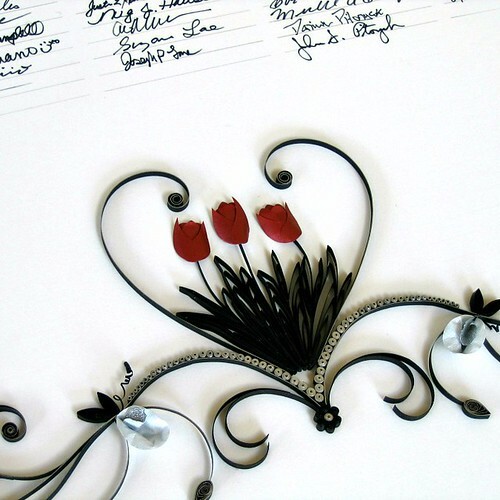 Eventually the couple decided that calligrapher Riva Brown of Living Letters Studio, who I often collaborate with, would go ahead and prepare it, but I would add the quilled design after the wedding to keep it safe while guest signature lines were filled in. Much time passed and I assumed the couple had decided they were happy with the beautifully lettered certificate just as it was - completely understandable. As it turned out, they had eloped and so it had taken quite a while to gather signatures of family and friends. Not only that, they now have three children. Susanne requested deep red tulips arranged inside a heart to represent each child and positioned just as you see them here... the center tulip would stand tall with the others curving toward it. To make them, I cut and layered metallic sculpture paper. She also requested another favorite flower, white sweet peas. I found that paper wasn't quite malleable enough to make realistically delicate blossoms and buds so I used reversible textured foil - white on one side, silver on the other. 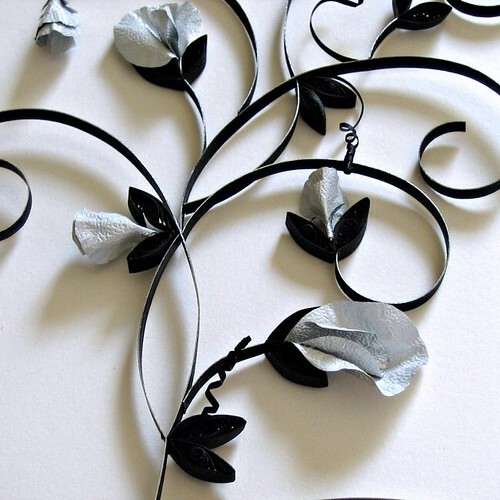 To make vine tendrils, I cut quilling paper into 1/32-inch strips and coiled them tightly at one end. 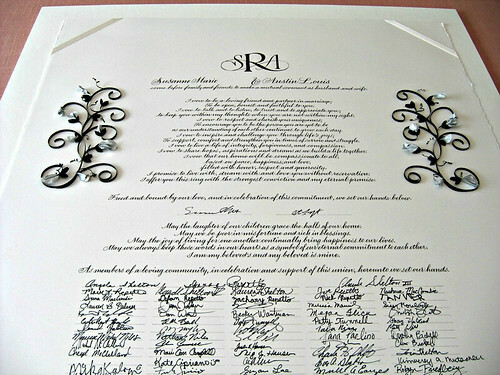 Silver-edge black paper was used for the scrolls, tricky to show in photos, but it shines beautifully. As you might have guessed, the most time-consuming part was the final gluing. This is when I find myself practically holding my breath as I make sure that the design winds up perfectly balanced. My trusty laser level came in handy once again as creating a mirror image with ever-shifting paper scrolls is a challenge! The 22 x 30 inch certificate is now being framed by Riva and will soon hang in the couple's home where they plan to enjoy it for many years to come. Absolutely stunning Ann, as your work always is! Absolutely beautiful, Ann! Thanks for sharing and inspiring. This is so pretty! Love the sweet peas as well as the meaning of the tulips within the heart. I can imagine how difficult it must have been to get it balanced while gluing. Anyway you did a marvelous job on this keepsake. Thanks Leanne, that's so nice of you to say! I think that's your record for longest intended project, right? As always, such painstaking attention to the most exquisite details, which just makes it just so. It must feel so good to gaze on a piece like this when it's complete. Congrats Ann! Yes, it's probably the record holder though I've had some ideas of things to make in my own mind that still aren't done - or even started, haha. Thanks Cecelia! Unique designs! Love them ! How Elegant!! It is always a treat to see your quilling. The sweet peas are shaped to perfection. 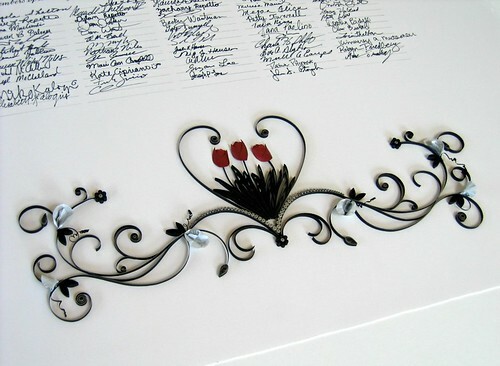 It is a brilliant idea , using foil for the flowers the texture makes them look so realistic. Always in awe of your neat Quilling and even scrolls!! Thank you, Suganthi! That's so nice of you to say. This is my most favorite yet! I love the tulips!